If you are not sure where to start, click on the "Help Me Choose" button which will help you to select the correct mirror for its intended environment. This range of unbreakable stainless steel traffic mirrors are designed to be installed where vandalism or risk of flying objects such as stone chips are a likely problem. 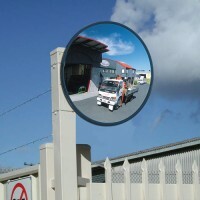 These convex traffic mirrors are suitable for demanding roads and highways and for car parking lots, commercial and industrial areas with larger volumes of traffic. Designed specifically as an unbreakable external mirror it features heavy duty steel engineering and is galvanized for long life. The tough stainless steel convex mirror face is highly polished and requires minimal maintenance giving many years of great service. Bracket and fittings are manufactured from heavy grade steel and galvanized for superior protection. 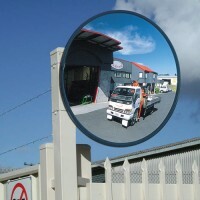 The 24" unbreakable stainless steel traffic mirror is designed to be installed where vandalism or ri.. 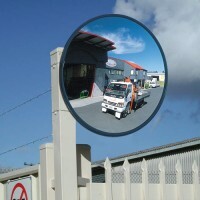 The 32" unbreakable stainless steel traffic mirror is designed to be installed where vandalism or ri.. TEMPORARILY SOLD OUT! Contact Us for Re-Stock Information and availability. Similar Products..